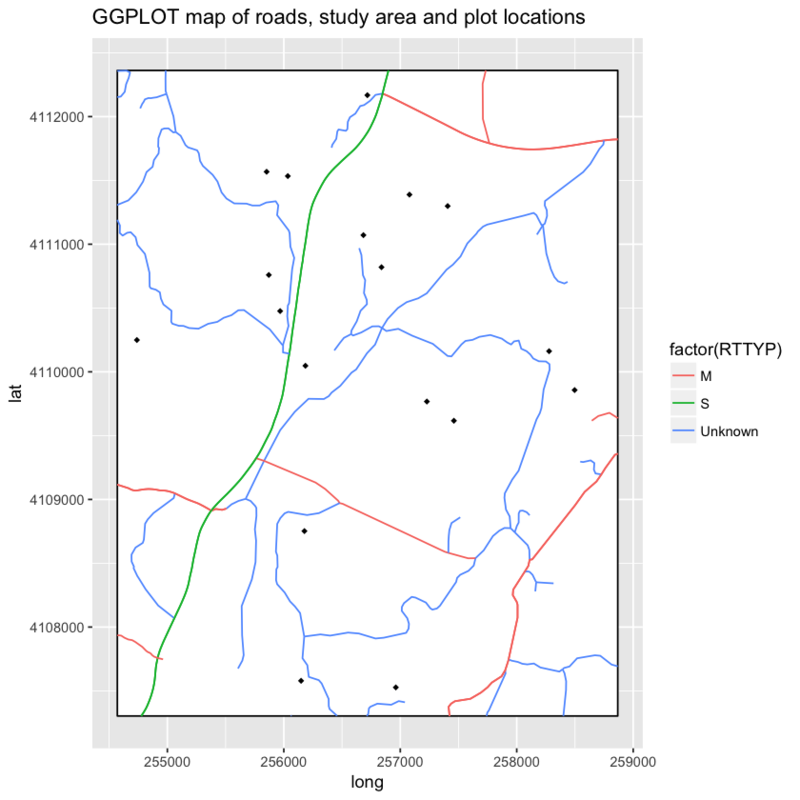 Create a map in R using ggplot(). 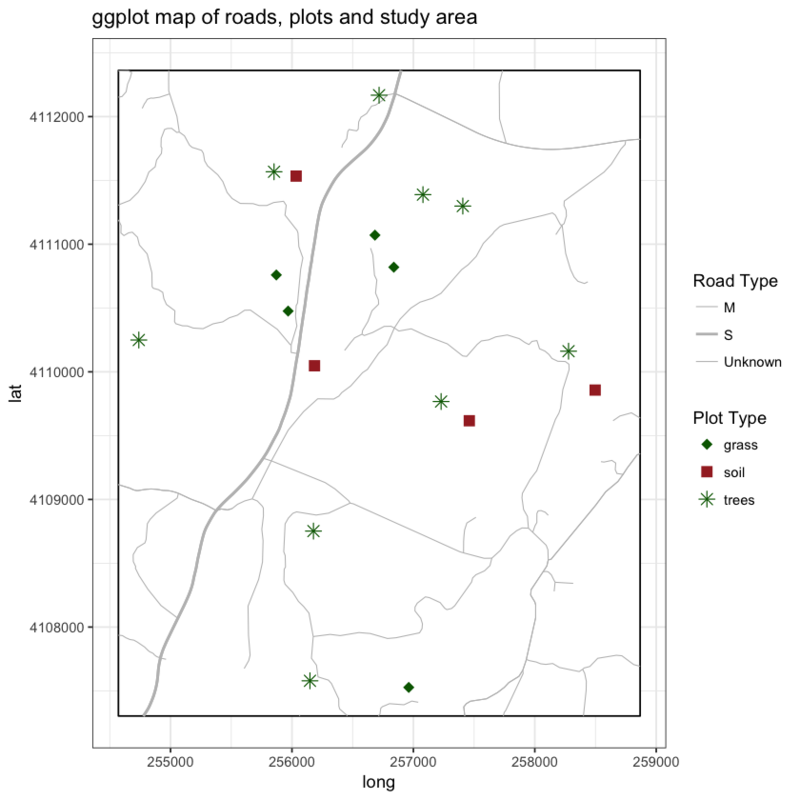 Plot a vector dataset by attributes in R using ggplot(). In the previous lesson, you used base plot() to create a map of vector data - your roads data - in R. In this lesson you will create the same maps, however instead you will use ggplot(). 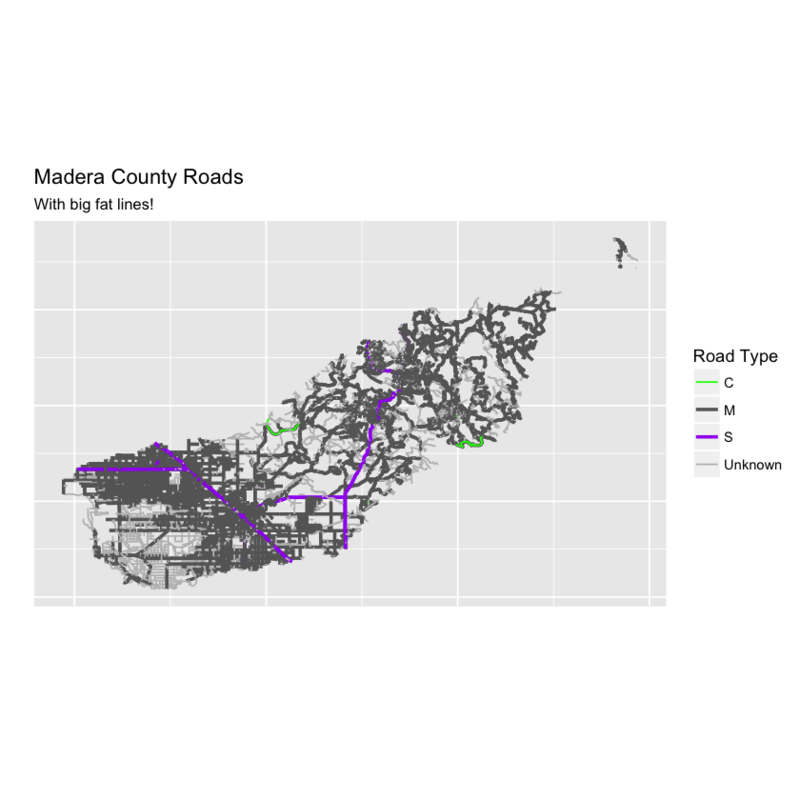 ggplot is a powerful tool for making custom maps. Compared to base plot, you will find creating custom legends to be simpler and cleaner, and creating nicely formatted themed maps to be simpler as well. However, you will have to convert your data from spatial (sp) objects to data.frames to use ggplot. The process isn’t bad once you have the steps down! Let’s check it out. Data Tip: If your data attribute values are not read in as factors, you can convert the categorical attribute values using as.factor(). First, let’s import all of the needed libraries. # note that you don't need to call maptools to run the code below but it needs to be installed. Next, import and explore the data. View attributes of and plot the data. ##  "M" NA  "S" "C"
It looks like you have some missing values in your road types. You want to plot all road types even those that are NA. 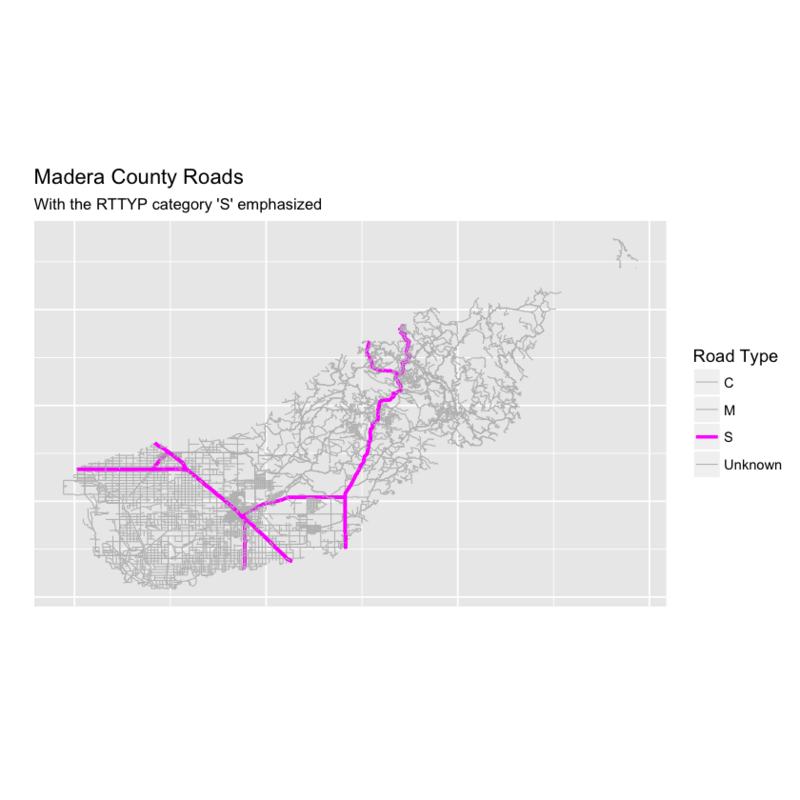 Let’s change the roads with an RTTYP attribute of NA to “unknown”. ##  "M"       "Unknown" "S"       "C"
When you’re plotting with base plot(), you can plot spatial sp or raster objects directly without converting them. However ggplot() requires a data.frame. Thus you will need to convert your data. You can convert he data using the tidy() function from the broom package in R.
Data Tip: The tidy function used to be the fortify function! The code for the tidy() function is exactly the same as the fortify() code. 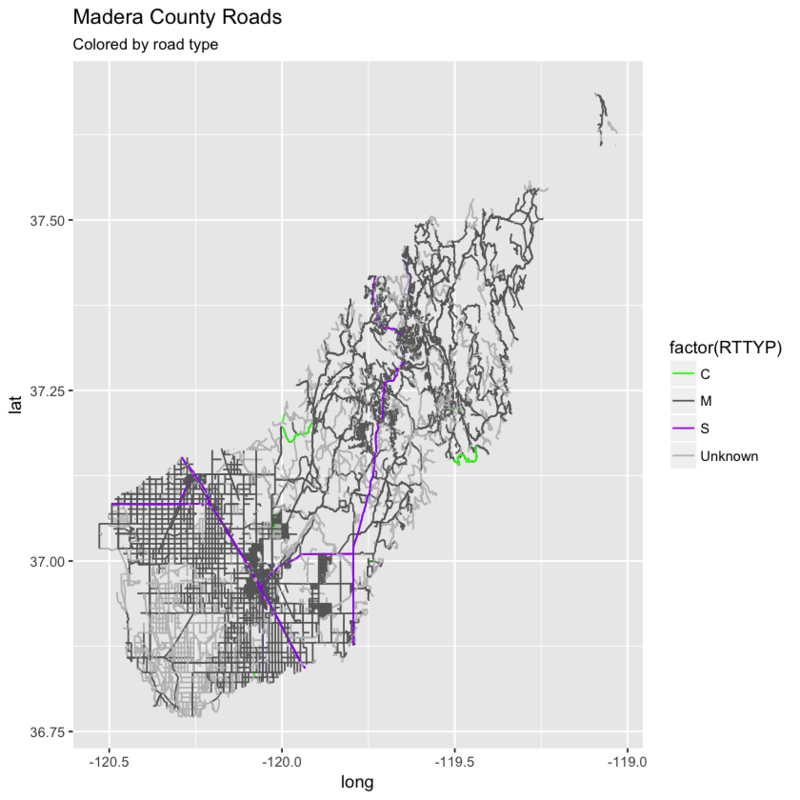 Calling the tidy() function on your sjer_roads spatial object. 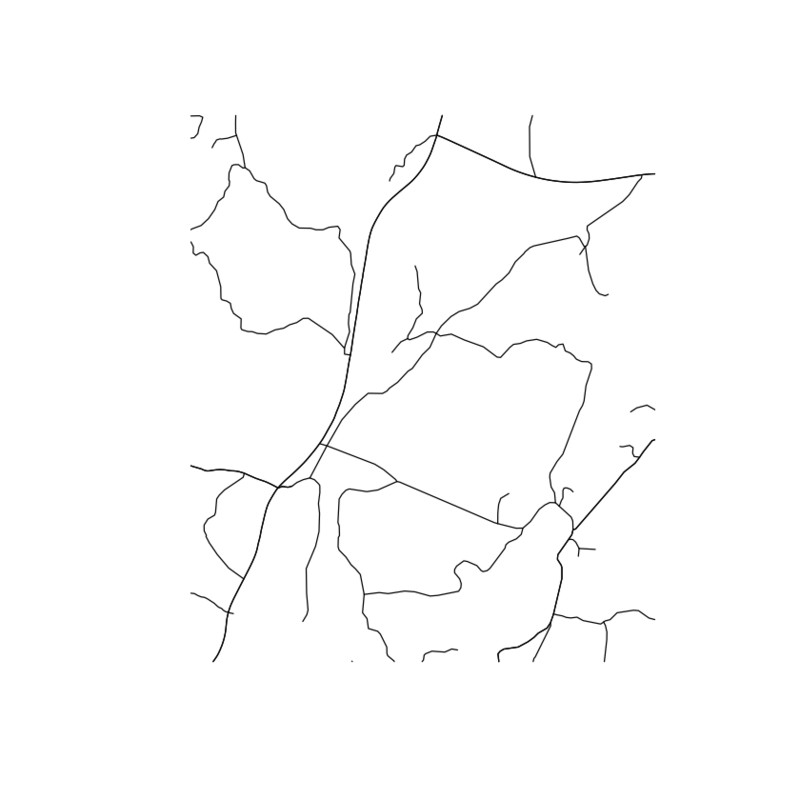 Adding an id field to the spatial object data frame which represents each unique feature (each road line) in the data. Joining the table from the spatial object to the data.frame output of the tidy() function. Let’s convert your spatial object to a data.frame. Once you’ve done this, you are ready to plot with ggplot(). Note the following when you plot. The x and y values are long and lat. These are columns that the tidy() function generates from a spatial object. The group function allows R to figure out what vertices below to which feature. So in this case you are plotting lines - each of which consist of 2 or more vertices that are connected. You can color each line by type too by adding the attribute that you wish to use for categories or types to the color = argument. Below you set the colors to color = factor(RTTYP). Note that you are coercing the attribute RTTYP to a factor. You can think of this as temporarily grouping the data by the RTTYP category for plotting purposes only. You aren’t modifying the data you are just telling ggplot that the data are categorical with explicit groups. Figure out how many unique road types you have. Specify the colors that you want to apply to each road type. Finally you plot the data - you will use the scale_colour_manual(values = c("rdType1" = "color1", "rdType2" = "color2", "rdType3" = "color3", "rdType4" = "color4")) to specify what colors you want to use for what attribute value. 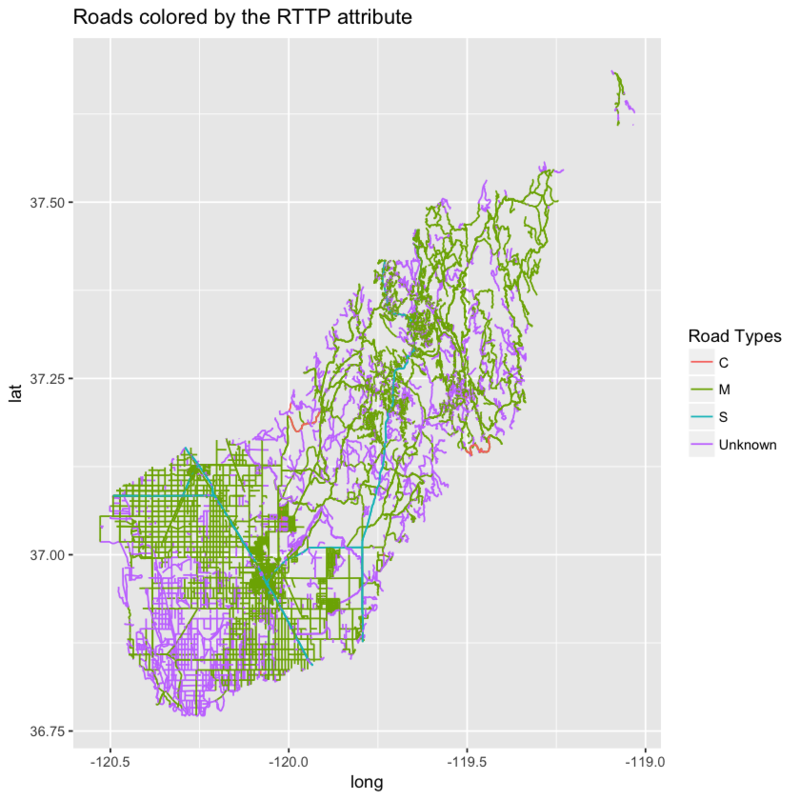 Let’s plot your roads data by the RTTYP attribute and apply unique colors. ##  "green" "grey40" "purple"   "grey"
Notice that above the colors are applied to each category (C, M, S and Unknown) in order. In this case the order is alphabetical. Finally you can remove the axis ticks and labels using a theme() element. Themes are used in ggplot() to customize the look of a plot. You can customize any element of the plot including fonts, colors and more! Remove the x and y axis ticks and label using the theme argument. Remove the x and y labels using the x = and y = arguments in the labs() function. Customize the legend title using labs(color =). 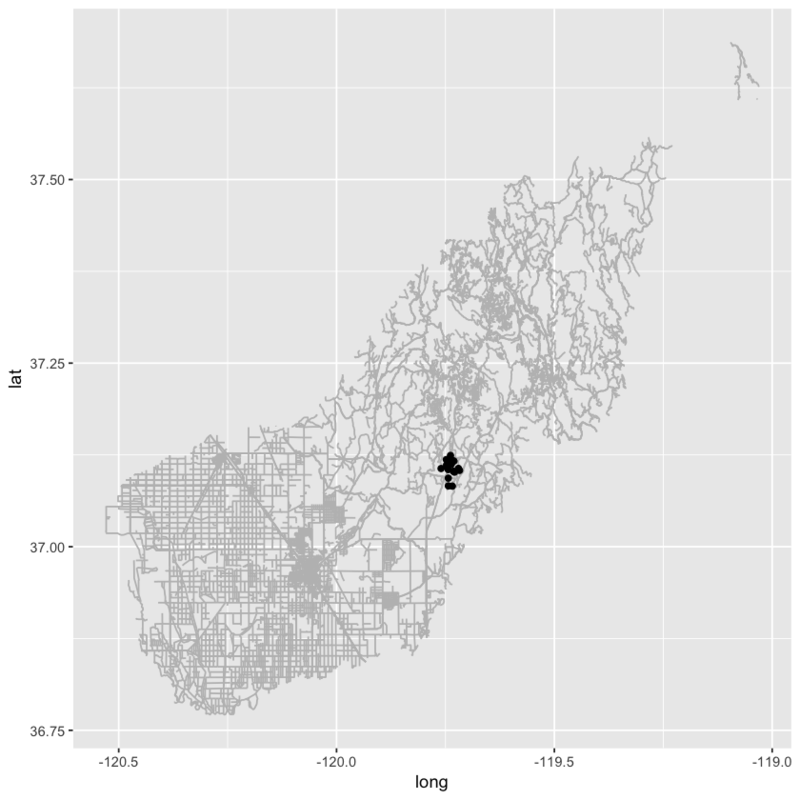 Finally you can use coord_quickmap() to scale the x and y axis equally by long and lat values. Data Tip: There are many different ways to ensure ggplot() plots data using x and y axis distances that represent the data properly. coord_fixed() can be used to specify a uniform x and y axis scale. coord_quickmap() quickly adjusts the x and y axis scales using an estimated value of the coordinate reference system that your data are in. coord_map can be used to handle proper projections that you specify as arguments within the coord_map() function. You can adjust the width of the lines on your plot using size =. If you use size = 4 with a numeric value (e.g. 4) then you set all of line features in your data to the same size. If you want a unique line width for each factor level or attribute category in your spatial object, you can use a similar syntax to the one you used for colors. Here you use scale_size_manual() to set the line width for each category in the RTTYP attribute. Similar to the colors set above, ggplot() will apply the line width in the order of the factor levels in the data. This is by default alphabetical. You’ve set the size to factor(RTTYP). You’ve assigned the size using the size_scale_manual() function. # using size for a discrete variable is not advised error -- need to figure this out? But this is ugly, right? Let’s make the line widths a bit thinner to clean things up. Create your own custom map of roads. 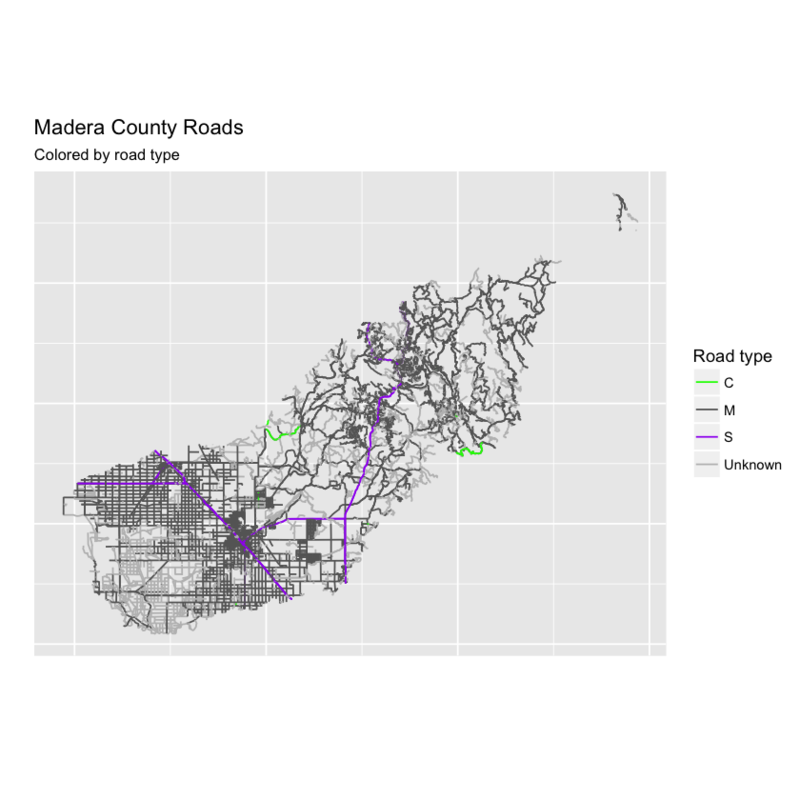 Adjust the line width and the colors of the roads to make a map that emphasizes roads of value S (thicker lines) and that de-emphasizes roads with an RTTYP attribute value of unknown (thinner lines, lighter color). Next, let’s add points to your map and and of course the map legend too. 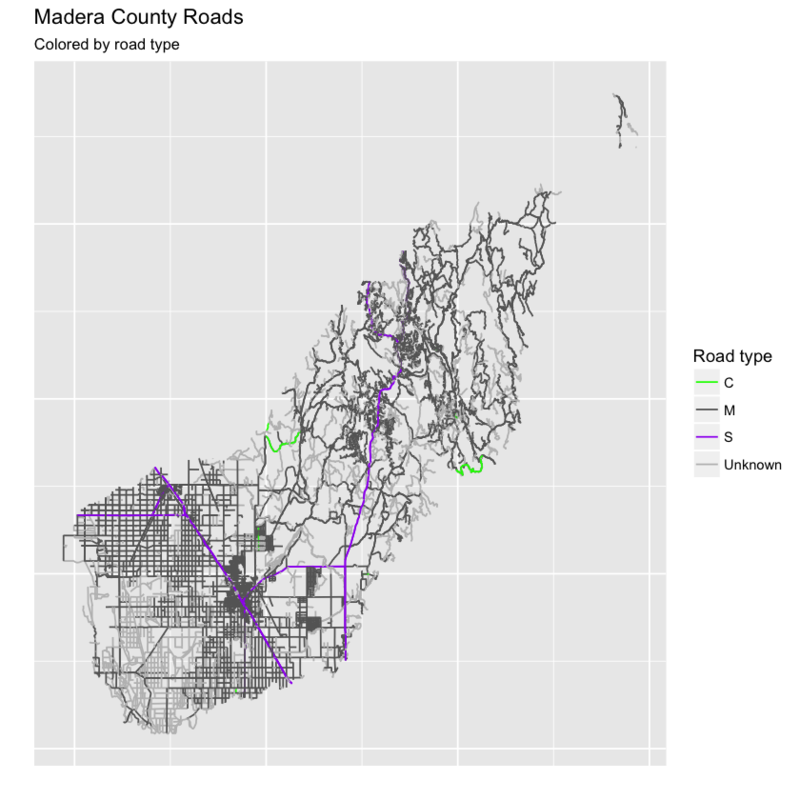 You will import the shapefile data/week-04/california/SJER/vector_data/sjer_plot_centroids.shp layer. 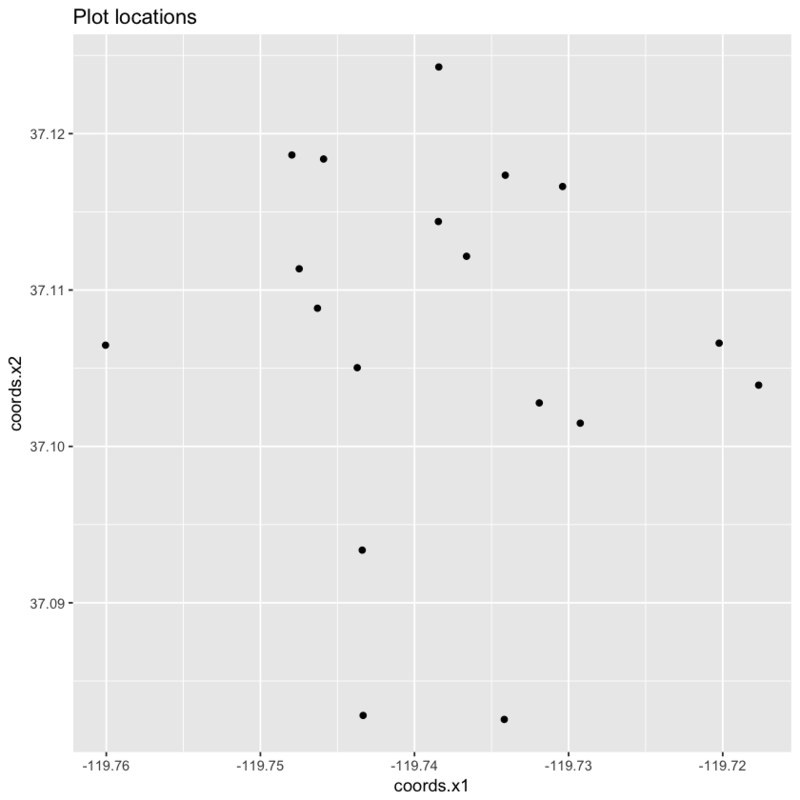 This data represents study plot locations from your field work in southern California. Let’s import that data and perform any cleanup that is required. Next you can tidy() up the data as you did before… or can you? Note that this time you imported point data. You can’t use the tidy function on points data. Instead, you simply convert it to a data.frame using the function as.data.frame. Next, let’s plot the data using ggplot. Great! You’ve now plotted your data using ggplot. Let’s next combine the roads with the points in one clean map. You can layer multiple ggplot objects by adding a new geom_ function to your plot. 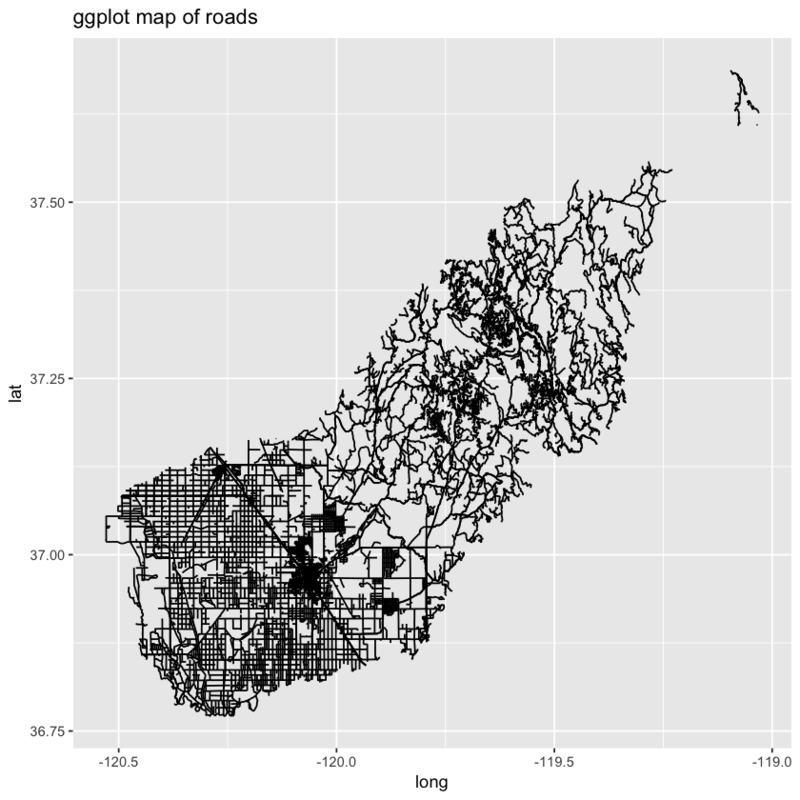 For the roads data, you used geom_path() and for points you use geom_point(). 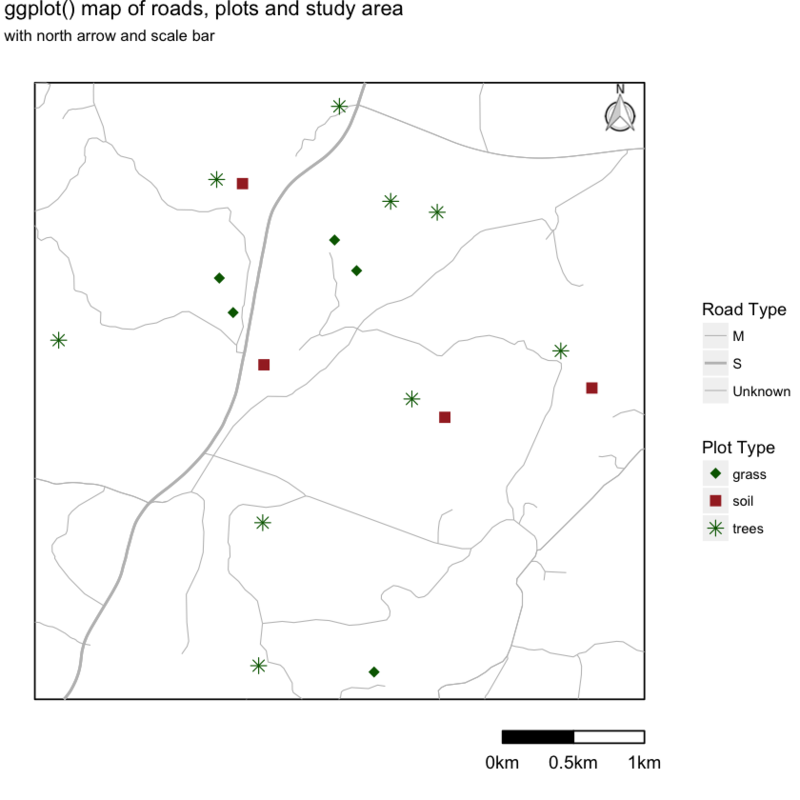 Note that you add an addition data layer to your ggplot map using the + sign. A better approach is to crop your data to a study region. That way you aren’t retaining information that you done need which will make plotting faster. Let’s walk through the steps that you did above, this time cropping and cleaning up your data as you go. Then explore the data to determine whether you need to clean the data up. 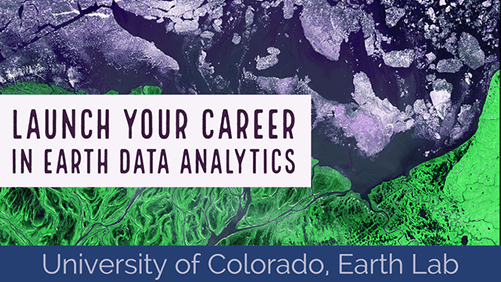 It looks like your data are not all in the same coordinate reference system (CRS). Let’s go ahead and reproject the data so they are in the same CRS. 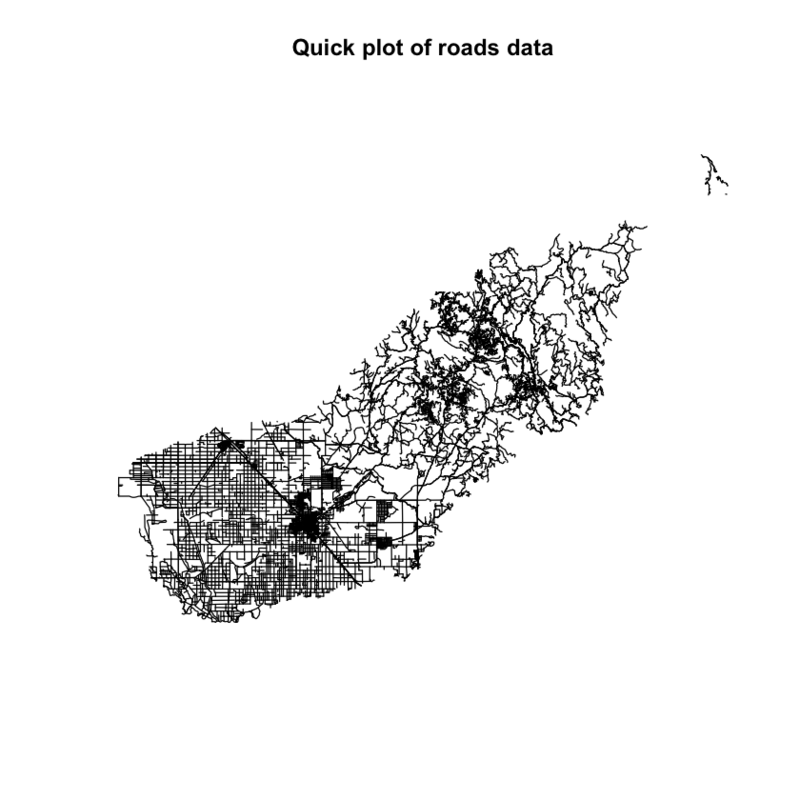 Also below you spatially CROP the roads data since you only need road information for your study area. This will also making plotting faster. 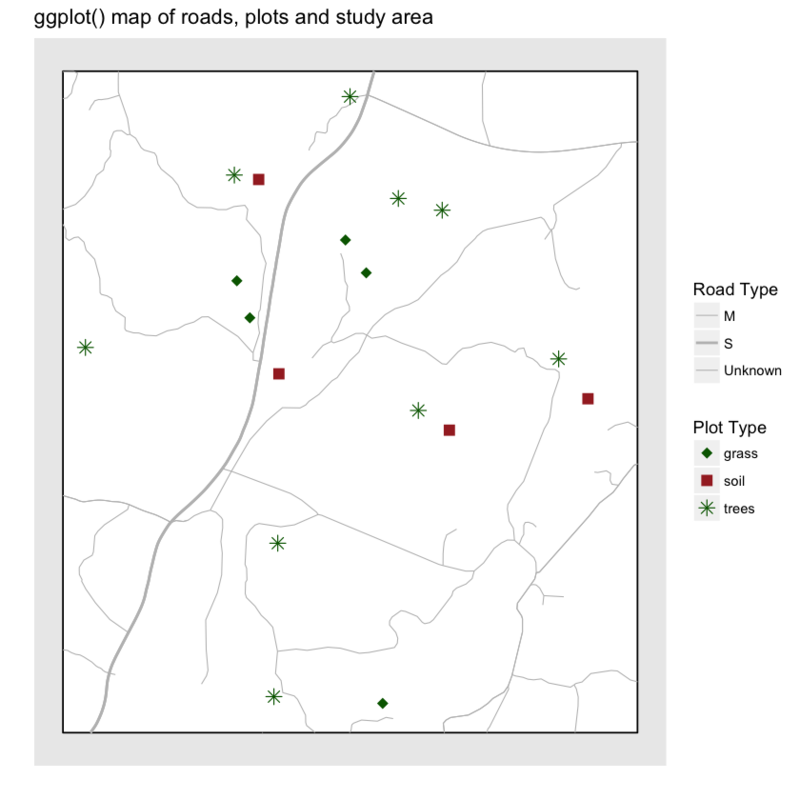 Next, you convert the study_area spatial object to a data.frame so you can plot it using ggplot. In this case you only have one extent boundary for the study area - so you won’t need to add the attributes. Now that you have all of your layers converted and cleaned up you can plot them. 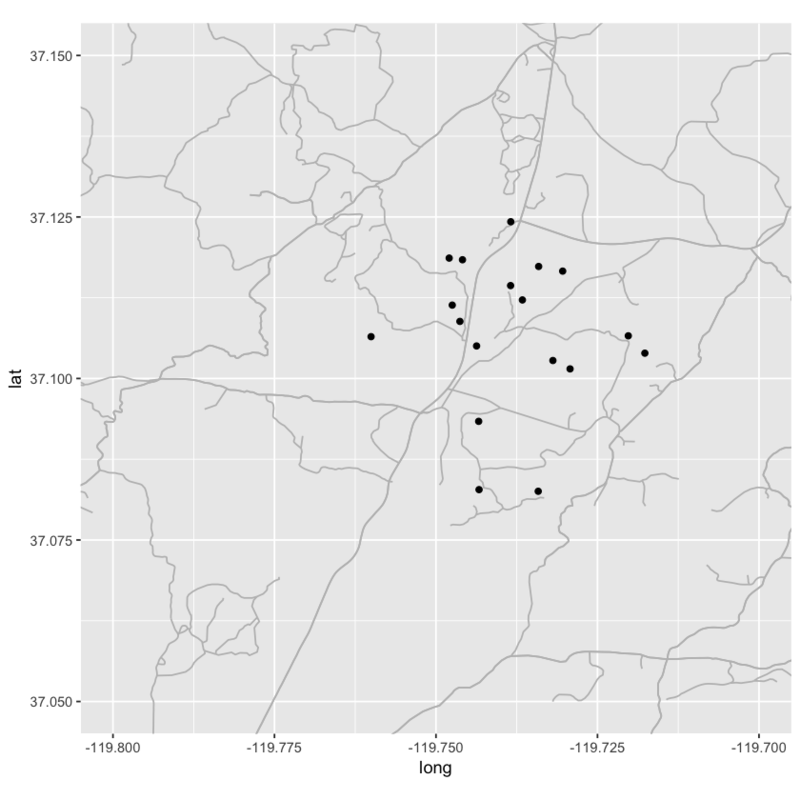 Notice that plotting is much faster when you crop the data to only the study location that you are interested in. Finally, let’s clean up your map even more. That’s apply unique symbols to your plots using the plot_type attribute. 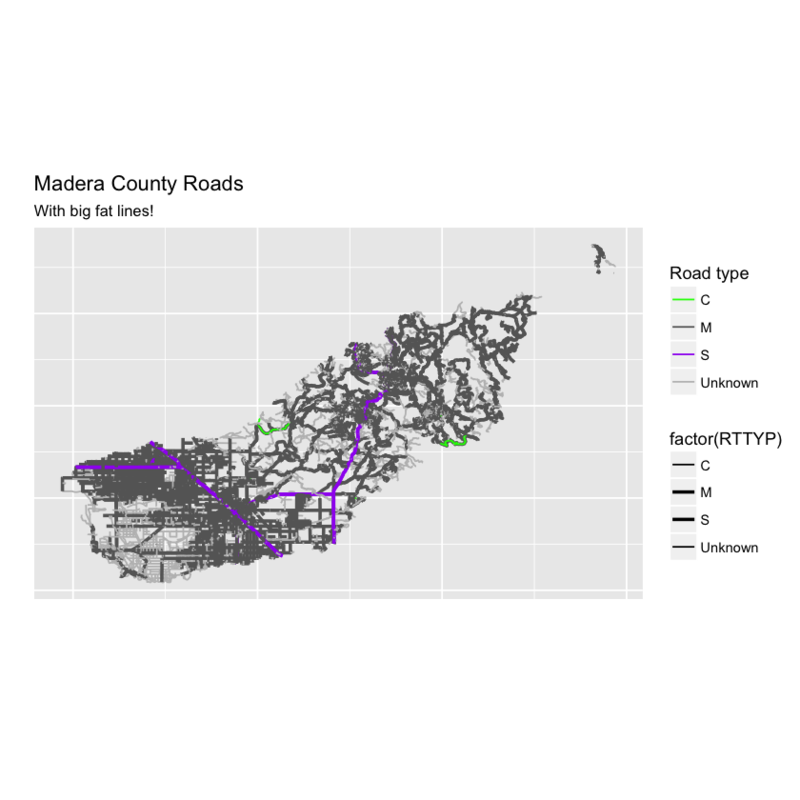 Note that it can be difficult to apply unique colors to multiple object types in a ggplot map. Thus you will keep your symbology simple. Let’s make all of the roads the same width and map colors and symbols to the plot locations only. The plot locations are what you want to stand out anyway! Finally, let’s clean up your map further. You can use some of the built in functionality of cowplot to adjust the theme() settings in ggplot. NOTE: cowplot does the SAME things that you can do with theme() in ggplot. It just simplies the code that you need to clean up your plot! By default it removes the grey background on your plots. However let’s adjust it even further. the x and y axis text and ticks. the axes lines - axis.line. You can use the ggsn package to magically add a legend and a scale bar to your final map. You can also use this package to create a “blank” map background - removing all grid background elements. Let’s give it a go. You can adjust the size and location of the north arrow as well. # scalebar isn't quite working just yet.... coming soon!